Historic charm, high-flying deals and the best music in America are at the heart of downtown Nashville. The hotel's guests are close to everything, especially the Ryman Auditorium and Printer's Alley. There's a reason why this unique Southern city leaves a lasting impression on the guests of the Hotel Indigo® Nashville Downtown hotel. Located in the historic American Trust and Nashville Trust buildings, our hotel's patrons in downtown Nashville, TN enjoy a tranquil oasis in the heart of Music City.Discerning corporate travelers appreciate the thoughtful, business-friendly amenities provided to the hotel's guests in Nashville, TN. From free Wi-Fi access to a 24-hour Business Center to meet the busiest schedules, we help you stay productive. Being minutes from the State Capitol, County Courthouse and major companies in the heart of Nashville is another reason to select this unique hotel.Music sets the beat in downtown Nashville, and the hotel's patrons are minutes from the Entertainment District and historic Ryman Auditorium. NFL fans love us since we're the closest hotel to LP Field, home of the Titans. After a day at area museums, spend the evening in Printer's Alley listening to the best in live music.Whether you play hard or make hard deals in downtown Nashville, our hotel's exquisite rooms and delightful amenities promise a terrific experience. Savor an excellent meal in the District Bar & Grill or stop in for the nightly live entertainment and a favorite beverage. Our courteous and friendly staff, inspired decor and boutique approach to hospitality offer you a warm Southern welcome! The Hotel Indigo highlights above are subject to change without notice. 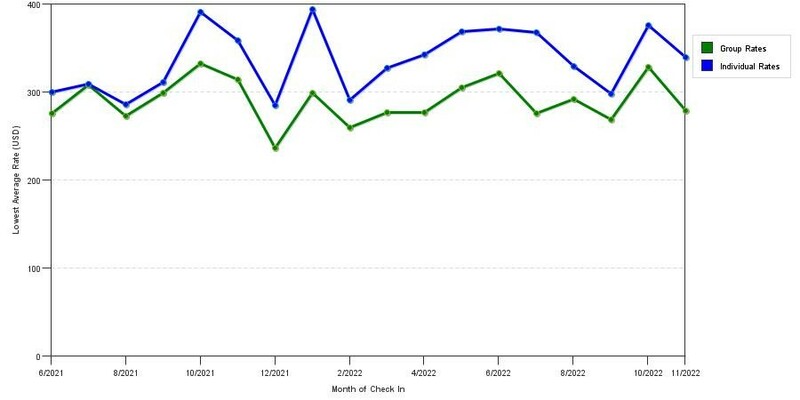 The graph above is trends of room rates for both our group prices and the lowest online individual prices our system could find at the time the group offer was submitted. The best group discount displayed is 24.0% in the month of August 2018 and the highest average individual rate is $329 in the month of November 2017. This chart will show past seasonality and also project future months. If you are flexible with dates, you may want to consider staying at Hotel Indigo Nashville in a month when rates are lower. 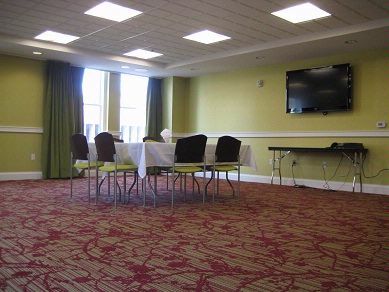 Below are the meeting, banquet, conference and event spaces at Hotel Indigo Nashville. Feel free to use the Hotel Indigo Nashville meeting space capacities chart below to help in your event planning. Hotel Planner specializes in Nashville event planning for sleeping rooms and meeting space for corporate events, weddings, parties, conventions, negotiated rates and trade shows. The Atkins Ballroom is equipped with ceiling mounted LCD Projector and wall mounted drop screen. Cable available. 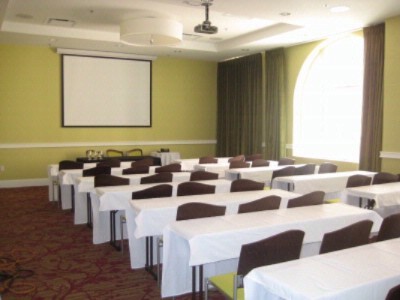 40 x 30 x 18 Ft.
Meeting Room Rental is discounted with catered food and beverage functions. 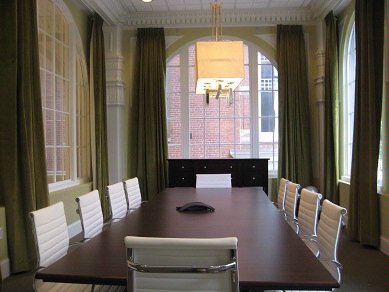 The Williams Boardroom is equipped with 32" flat panel wall mounted screen with computer hook up capability. Cables provided. 26 x 13 x 12 Ft. The Daniels Room is equipped with 55" flat panel wall mounted screen with computer hook up capability. Cables provided. 24 x 27 x 8 Ft. The Jones room is equipped with wall mounted 55" flat panel screen with computer hook up capability. Cable provided. 17 x 24 x 8 Ft.
24 x 12 x 15 Ft.
57 x 25 x 8 Ft.
56 x 27 x 24 Ft.